Home Certified has created a service for providing temporary heat as a substitute to operating the HVAC system and improving the performance of your homes. This service offers an operational and financial alternative when the HVAC is not available or one does not desire to operate it. At the time drywall is installed Home Certified will set-up and monitor electric heaters, air movers, dehumidifiers, window mounted exhaust fans for the drying of drywall. Once texture is complete, Home Certified would remove all equipment except the electric heaters. Electric heaters will remain in the house until the dust/debris in the house is sufficiently low (estimated to be at time of carpet installation) and HVAC system can be operated. provide a marketing opportunity to the homeowners by promoting that the HVAC system is not operated while the house is under construction. 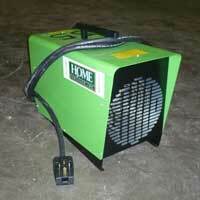 Home Certified has over 60 diesel powered 90,000 BTU indirect fired heaters. These furnaces are ideal as a temporary heat solution when the HVAC is not operable due to lack of permanent power or gas. 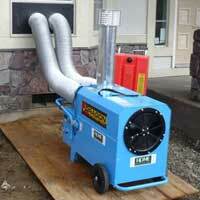 Heaters have external fuel tanks that can operate up to 3 days on one tank of fuel. All of our service vehicles have diesel fuel tanks installed for re-fueling. Our service includes set-up, monitoring, re-fueling and take aware.